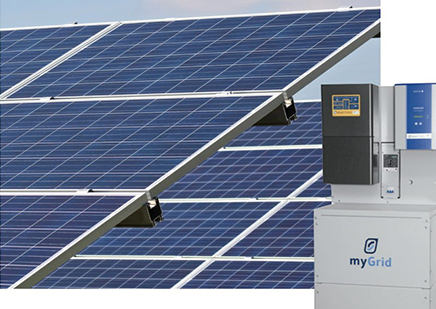 This versatile grid feed inverter offers the ability to store energy in and use energy from a battery storage system. Whether you wish to install a new solar hybrid system or update your existing renewable energy system to Solar Hybrid, the SP PRO provides the solution. AC / DC coupling: Which is best? The SP PRO Solar Hybrid function allows the user to feed virtually all of their renewable energy back into the grid to maximise their net feed in tariff. The SP PRO minimises the solar power consumed by the user by shifting the user’s day time consumption to a time of low tariff. An SP PRO solar hybrid system gives you back control of your electricity bill. By appropriately balancing grid power with the available renewable energy and stored battery energy, the SP PRO minimises your electricity bill. With an SP PRO solar hybrid system you decide how much you pay for your power, not the utility. During a power outage, the SP PRO solar hybrid systems will supply the load from the renewable energy source whilst storing any excess energy in the battery bank to be used as needed. This gives the user continuous power and peace of mind. By combining the SP PRO inverter with a KACO Powador 02 or 00 series inverter in a Selectronic / KACO Managed AC coupling configuration, a fully integrated and managed Solar Hybrid system is now possible. With system sizes from 3kW to 20kW single phase (with up to 30kW of PV solar), 6kW to 40kW split phase (with up to 70kW of PV solar) and 9kW to 60kW three phase (with up to 105kW of PV solar) the SP PRO Series of inverters is suitable for use in On Grid power systems for residential, commercial and industrial applications. It is now possible to install all the PV solar you want and still comply with the Utility imposed grid feed power limit. The fixed Grid Feed-In Power Rating in your SP PRO GO inverter will give the Utility assurance that your battery based PV solar power system will never export more than your allowable power. This is regardless of the size of the SP PRO GO inverter, the configuration settings within the SP PRO GO inverter or the amount of Managed AC coupled PV solar or DC coupled PV solar.